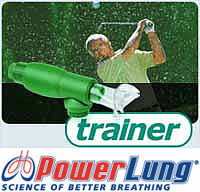 PowerLung Trainer helps you regain respiratory strength and enables you to breathe easier when you exercise, train or work and to have better and stronger breath control when you sing, play or speak. Now your breathing muscles can meet your needs and desires with the same technology used by professionals. Each PowerLung model comes with CD-ROM with training video, user guide, handy carrying case, and PowerLung Power Washe.